Apparently people are becoming more casual. There are now such things as luxury jogging bottoms. But I’ll put my money on the fact that – even as the fashion wheel turns – the suit will remain the formal attire of choice. There are just no other contenders. For those that understand – hopefully, those that read this blog – there are also grades of formality to the suit. At one end of the spectrum are Neapolitan linens. In the middle are Milanese and drape cuts. And at the other end are super-sharp English suits like this, from Edward Sexton. When do you wear the different things on that spectrum? It is a consideration of people and place. In the office most days, I wear a Neapolitan jacket and trousers. But when I’m on show, it’s more than often a suit. And when I really want to feel put together, it’s a structured, roped piece of double-breasted flannel. Here, I was on TV. Being interviewed by a German television station about my latest book Best of British: The Stories Behind Britain’s Iconic Brands. I’m on display. I am representing myself and even British menswear – with all its history, craft and tradition – for this German audience. Clothing for people and for place. 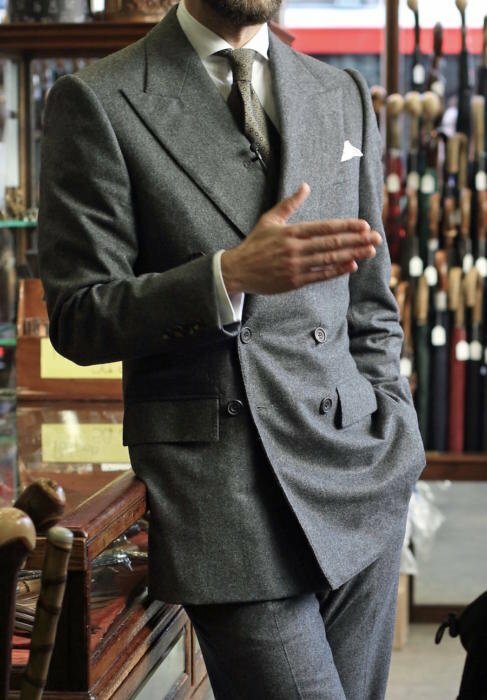 So a double-breasted grey flannel suit, with Edward’s broad lapels and fantastic roped shoulders, his long legs and slim sleeves. White shirt (most formal colour) with double cuffs (most formal style). Muted grey/green tie. White linen hank. And beautiful GJ Cleverley bespoke city shoes. With their thin uppers, thin sole and waist that disappears under the foot. Lending delicacy to the tread. Dressing up makes you feel good. It makes you feel pointed, ready, prepared. Which is exactly what you need when someone puts a camera in your face. You can follow the discussion on Edward Sexton flannel – When to wear a suit by entering your email address in the box below. You will then receive an email every time a new comment is added. These will also contain a link to a page where you can stop the alerts, and remove all of your related data from the site. Wonderful suit. Congrats. Haven’t been to Smith for some time but this photo prompts me to drop in next time I’m in the area. Bravo, Simon! The fashion people write about bespoke tailoring and they often wear bespoke tailoring but they have no understanding of it. None. Any person that believes jogging pants can be worn with a smart jacket is most likely a fashion interloper or is suffering a rather severe mid-life crisis. But doesn’t a suit imply the possibility to change? A day may consist of several types of activities and one would not go to the pub in a suit, for instance. I often reach out for a suit and then.. oh no there’s that meeting with some friends afterwards and it’s a jacket again. Congratulations with your Sexton suit, looks wonderful! I generally prefer more muted colours and patterns for formal occasions. Great suit indeed! Would you, however, say that it is your most formal one? I am thinking of your impeccable blue Cifonelli one… and wondering whether a darker color or wool instead of flannel would not be even more formal – if I am right, do reserve that for an evening TV-interview? Whilst a double breasted flannel suit is at the more formal side I believe the jacket alone can also work remarkably well with chinos or jeans . The double breasted nature almost substituting as a coat whilst a scarf adds to protect further against the cold . Thanks. In my experience flannel never really works as an odd jacket, and certainly not one as structured as this. Great suit Simon. I notice the double cuffs – although double is undoubtedly more formal than single, do you consider single cuffs so (relatively) informal such that they should never be worn with a suit like this, or say black tie? Wonderful tie. Is it Drake’s? Do you have any comments on the Sexton MTM service for those of us that are more constrained on budget? I increasingly don’t bother with wearing a suit in the office , except if I am meeting clients as I found my suit jacket would sit in the cupboard all day. At the moment it’s flannel or smart wool trousers, shirt, tie and more often than not suede shoes with knit wear as deference to the temperature outside. What is the weight of the fabric? 13 oz? I had to laugh at the smart joggers thing. Only last week I was browsing a popular clothing website and saw something on the list described as “smart joggers” I was in disbelief for about an hour… I almost had to go for a jog to calm down…. In my running oxfords.. I don’t wear suits a lot but What is the world coming too when people are too casual for even jeans?? Simon, I missed your piece on this suit back in June, so great to see it here. This article makes me think a) I absolutely must get a double breasted Edward Sexton suit (even if I only get chance to wear it once a year) and b) I must play more with the structure and style of my suits and jackets. I’m always afraid of trying a new tailor because I’m scared of an expensive mistake where I decide I don’t like the house style or it doesn’t suit me. I need to be more adventurous! Just a point on single cuffs; whilst you should never wear them with black tie, they are a must with white tie. No idea why though. How would you wear a mid grey Neapolitan jacket in fresco? I have one as part of a NSM bespoke suit. While the trousers are quite versatile on their own. I fear the jacket for being less so. While the cut is very soft and casual, the lack of patterns and the grey colour in general concerns me as far as the “half-of-a-suit” associations go. Lorenzo told me a grey odd jacket is very difficult to wear. Any advices? The imitation brogues – have a search on the site. Lovely suit. Is this the only one of yours that compensates for your sloping shoulders? No, a few of them have a good bit of padding. Chittleborough & Morgan and Sexton are the most, but Huntsman and Kent Haste Lachter also do for instance. The most striking suit I’ve seen here, though taste is personal. I like the tie match as well – all too often people underestimate the power of texture and muted colors! Great look, but what about brown shoes? I share your disdain for those fashionistas that propagate the idea of jogging bottoms with a suit jacket and the like. This too will quickly pass and join the ‘Pee-wee Herman’ look in the read and laugh file. That said, the more interesting subject for me, and one that I’d love you to address is that of matching house styles and cloths to life styles. Since I trousered my last corporate dollar and became a free spirit I have little call or desire for the very formal but like to wear a suit when I’m in town, sometimes when I’m in the country or in hotter climates. I’ve even been known to wear one around the house! This life style change has lead to me becoming a great admirer of the more louche suit aficionado. The likes of Leonard Cohen, Ferry and Nighy come to mind. Would you consider doing a piece on this advanced art with specific focus on cloth choices. Simon, have You ever considered of not having flapped pockets on this kind of suit ? I am aware that jetted pockets are less common in the british tailoring (with the exclusion of formal suits) but IMO this variation could add simplicity and consequently more elegance to the outfit. At last I have found something we have in common, apart that is for the Sexton flannel. Although I went for single breasted, as I’m a bit wider than you around the middle! It is a beautiful suit but I think the cut of you A&S double breasted jacket (30/10 – double breasted checks and cream trousers) is superior. After analysing the photographs it appears that the sculpting of the chest in the A&S is fuller. When placed against roped shoulders and slim cut arms the fuller chest is more masculine and hence flattering. Inkster (I think) has commented about the high cut of the A&S collar, which again, though we are talking micro-details, is more superior on your figure. Also the longer points on the peaked lapels visually shrink the width of the chestpiece – again the A&S cut (smaller points on the peak) gives a more flattering proportion as it allows, visually, for a slightly broader chest. Contrarily however, the narrowed and flatter chest, when taken as part of a suit rather than just a jacket, allow for a longer silhouette giving the impression of heght – something difficult to achieve with broader cuts. Sorry to nitpick but in the study of these matters it is interesting to discern not just the cut but how, comparitively, the small details affect the overall composition and impression. I really do admire Sexton’s work, but at a heavy-set broad-chested 6ft, it’s really just not for me. This bit: “keep jetted pockets basted shut to avoid any chance of bagging open over time.” Superb, three star advice. This is why I come here. Thank you, Simon. I will, probably unwisely, being a regularly follower/commenter on your blog, give a tiny vote of confidence to the luxury joggers: I recently wore a pair on a 12 hr flight to tokyo and for that eventuality alone and perhaps around the house or popping out to grab a paper, they are fit for purpose: no I wouldn’t wear them in the club lounge but this time it was cattle class for me and teamed with a pair of common projects and a sunspel t-shirt I still looked more stylish than most and was probably a darn site more comfortable!! Time and a place and all that!! I am a bit surprised that you think that fresco is not suitable for odd jackets. Could you elaborate on why? And what other fabric would you recommend for a semi formal odd jacket for summer? I am thinking about getting one in brown made, but I think linen and cotton would be too informal for my office. I think you could just swing a French /navy fresco if you finished it with, say, off white MOP buttons, but agree something soft and possibly not too dry would work really well. (If I may be allowed) Sewing up the mouths of jetted pockets is rather naff, pedantic and unnecessary. Why not do up your trs pockets too? A pocket is there to be used. Occasional pressing and sensible use will keep it in good shape. I’d also disagree that a Sexton is more formal than an Anderson & Sheppard or even a Marks & Spencer suit. They are all the same thing. Just different cut and construction. Technically, Sexton will give a far superior fit. He’s technically brilliant. Pity that’s wasted on so many. Simon, Edward Sexton is well known for his women’s tailoring. Have you (and your wife) considered another item from him? I’m also curious how the Kathryn Sargent jacket worked out long term. Thanks. On the subject of tailoring…we know of Pitti, London Fashion Week and Birmingham Clothes Show but is there an annual UK tailoring industry event wherein cloth, trimmings, haberdashery and tailoring businesses get together? For many it would be useful to get information and ideas that could then translate into purchases and commissions. One could argue that a tailor serves this purpose but a wider display, particularly of cloth, might help drive buyers interest. LFW might be put forward but this seems very much about the promotion of brand and image rather than information for prospective customers. The suit looks great. In terms of proportion, are you unusually tall, over 6 feet for instance? It would appear that way. If you’re of average height, the suit is unusually flattering. You are almost 2 m tall? I thought you were around 185cm. Sorry, and a half an inch, not half a foot! Nice suit Simon, although I find the overly-structured shoulder rather artificial and less flattering than a Neapolitan one. However, does not the standing-off left lapel bother you? I find that very few tailors manage to get the lapels to fit the chest tightly, especially with DBs. If they have not gotten this right for the first fitting, they never get it could right with subsequent alterations. Have you also found this an issue and how do you deal with it? Thanks, and I know what you mean about the style. Strong and sharp though. The DB is an absolutely amazing suit. I have receny decided to get a fully bespoke suit and i am tending towards a DB. I love strong shoulders but a suit along the lines of what you are having here would be too formal for me. What tailor would you recommend for a structured look and a relatively contemporary style? I hope that my question is not too silly. A double breasted can be a great choice for a first bespoke suit, as the fit will be so different to RTW. It’s very hard to get a DB to fit well RTW. However, do be aware that it will mean you wear it significantly less than an SB. My favourite among relatively structured looks is Anderson & Sheppard. I’d recommend them.